Celebrating over 80 years of luxury on Central Park South, the historic Jumeirah Essex House first opened its gilded doors in 1931. 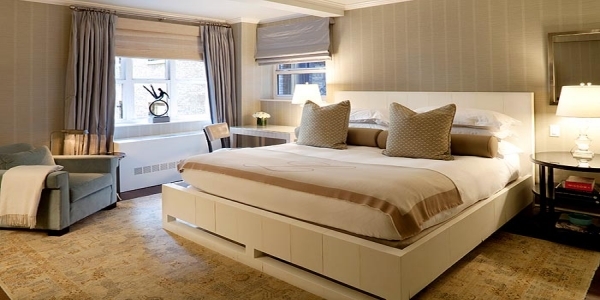 Jumeirah Essex House is nestled between the beauty of Central Park and the buzz of Broadway. Enjoy our stylish setting, and surround yourself in the elegance that has lured dignitaries, celebrities and world leaders to this exclusive hotel for years. Unwind in the relaxation lounge, let your cares melt away with an aromatherapy treatment in the soaking tub, or enjoy the steam room and sauna. Whatever your interest or level of fitness, Jumeirah Essex House has a vast range of offers to suit your individual needs. Each cardiovascular machine comes equipped with its own personal 13” Sharp Aquos LCD screen for your personal viewing pleasure. *Guests must be over the age of 18 to use the facilities. Jumeirah Essex House is a two time winner at the World Travel Awards 2011 being voted North America’s Leading Business Hotel and the United States’ Leading Business Hotel. Anchored in the heart of Midtown Manhattan, Jumeirah Essex House offers landmark sophistication and service in a historic Central Park setting. Many of New York City’s top attractions and business centres are located just minutes away, with convenient service to and from LaGuardia, JFK, and Newark airports, as well as Grand Central Station and Penn Station. Whether your New York City event is big or small, count on Jumeirah Essex House to provide unmatched service in a sophisticated, elegant setting. Here you will find information on seating capacities, floor plans, and room sizes. As well facilities and services that are available to you when you book your meeting or event with Jumeirah Essex House. We would be delighted to help you organise your wedding, special occasion, conference or business meeting so that it is a resounding success. The stylish Essex Rooms offer quiet interior views – perfect for guests looking for some relaxation. The newly renovated rooms feature custom-designed furniture, with alligator-print leather accents and exotic honey-toned wood veneers. Beautifully-appointed cabinetry units with leather-wrapped handles offer both desk and drawer space, and the bathroom features a jewel-toned amber-colored glass vessel sink. High-tech enhancements add distinction to each room. The Essex Room is available in a queen size (approximately 300 square foot/27.8 square meter), a king size or two full beds (approximately 330 square foot/30.6 square meter). Occupancy:Maximum 2 Adults for Essex Queen and Essex King Rooms. Maximum 4 people for Essex Double Room. Notes:For child & booking policies, please refer to the Check Rates & Book Now section. 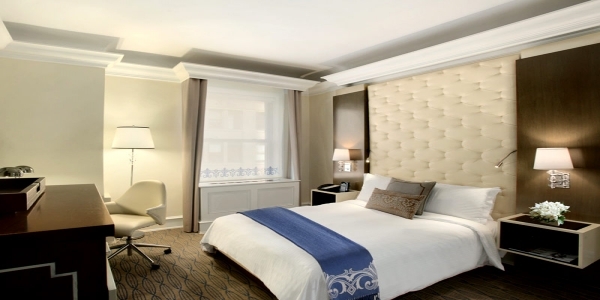 Offering dramatic views of New York’s famed Central Park, the Central Park Rooms are located on the 59th street side of the hotel. The elegant rooms exude an Art Deco-style, featuring custom-designed furniture with alligator-print leather accents and exotic honey-toned wood veneers. High-tech enhancements are available throughout. The Central Park Guest Room is available with a king bed (approximately 350 square foot/32.5 square meter) or a queen bed (approximately 280 square foot/26 square meter). The comfortable and intimate Manhattan Kings offer incredible views of New York City and, of course, a king sized bed. The new rooms feature custom-designed furniture with alligator-print leather accents and exotic honey-toned wood veneers. Beautifully-appointed cabinetry units with leather-wrapped handles offer both desk and drawer space, and the bathroom features a jewel-toned amber-colored glass vessel sink. The comfortable Junior Suites (approximately 500 square foot/46.5 square meter) are available with incredible views of New York City, or quiet interior views, and offer, of course, a king sized bed. This spacious room offers a separate sitting area, which includes a lush sofa that turns into a sofabed; perfect for travel with young children. The Junior Suites feature state-of-the-art technology for both business and entertainment needs. The new and spacious Essex Suites offer quiet interior views perfect for those looking to escape the hustle and bustle of the city. The suite features a spacious bedroom with custom-designed furniture with a deep red velvet and honey-toned color scheme, encompassing a living area with lush sofas, coffee table and flat screen television. High-tech enhancements are available throughout. The Essex Suites feature a king bed and sofa beds and are approx. 500 sq ft (47 sq m) in size. The suite features a living room with lush sofas, coffee table and HD LCD flat Panel TVs, notably quiet room, an oasis of calm from the bustle of the city. 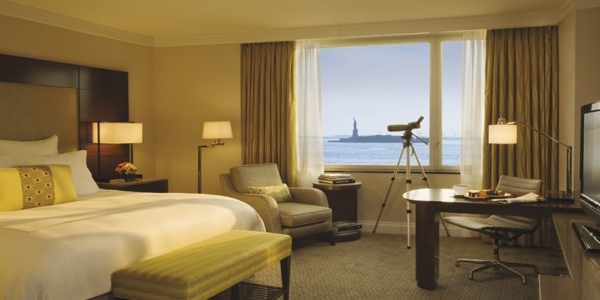 The new and roomy Manhattan Suites, located on the 58th Street side of the hotel, offer spectacular views of New York City. The suite features a living room with lush sofas, coffee table and flat screen television. The bedroom features custom-designed furniture with a deep red velvet and honey-toned color scheme, and the bathroom features a jewel-toned amber-colored glass vessel sink with plenty of countertop space. The Manhattan Suites (approximately 600 square foot/55.7 square meter) feature a king sized bed and a sofa bed. The Central Park Suites offer breathtaking views of New York’s Central Park. The new and comfortable rooms offer more than 750 sq ft (70 sq m) of space and feature custom-designed furniture with a deep red velvet and honey-toned color scheme. Lush sofas grace the suite as you enter the living room which also features a coffee table and flat screen television. The bedroom features beautifully-appointed cabinetry unites with leather-wrapped handles and the bathroom features jewel-toned amber-colored glass vessel sinks. 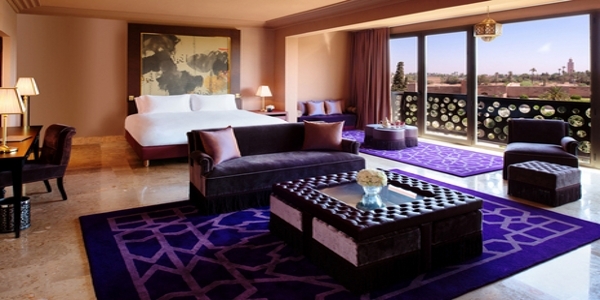 The Central Park Suite offers state-of-the-art technology and has a king bed and a sofa bed. Modern American cuisine and vibrant design, overlooking Central Park. The Dining Room at South Gate offers distinctive and seasonally-inspired fare. We partner with local organic farms, fishermen, & shellfish harvesters to ensure that we have the finest and freshest ingredients with which to prepare our ever-evolving menu. If you are in the mood for something more casual, drop by the Tavern for one of our signature cocktails or a glass of wine from our wine list of nearly 700 bottles, and enjoy a few delectable bar bites such as Crisp Crab Croquettes or Assorted Selection of Farmstead Cheeses. Early each morning, the chefs at South Gate create an incredible breakfast offering. Choose from a buffet of the freshest fruits, meats, cheeses and pastries, and enjoy a selection of cereals with homemade granola. To experience the ultimate in sophistication, bring your corporate or social event to our private dining space at South Gate. Exquisitely designed by Tony Chi to accommodate from 20 to 100 guests, our Gallery and Studio are sure to suit your needs, whether you’re planning an intimate dinner or an elegant soirée. Our dedicated private dining manager is always available to assist you with the planning and execution of your event.